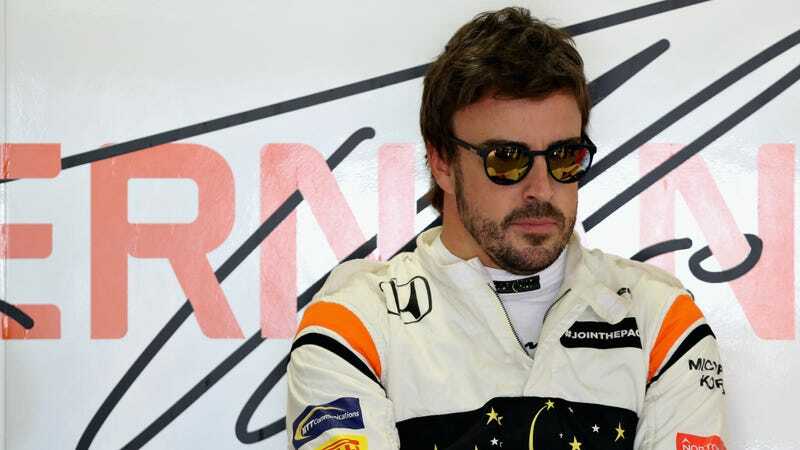 Professional McLaren Formula One sad man Fernando Alonso told Autosport that McLaren needs to start winning races by September for him to stay. Given that it’s more likely for space cats to discover unobtanium on Saturn by then, I think this is a nice way of telling everyone that he’s available for hire early on in the season. We have to win. If we are winning, before September or something like that, I will make a decision and I will stay. Alonso’s contract expires after this year, and his car has only finished one of the six races in 2017 after finishing a way-below-his-ability 10th for the 2016 season. His teammate Stoffel Vandoorne’s car has only finished two of this year’s races, so the other side of the garage doesn’t paint a hopeful picture, either. Much of the issue is with Honda’s hopeless power unit. Honda is late on getting a much-needed upgrade to the engine that was supposed to show up for this weekend—but didn’t—and can’t even give Honda a solid timeline for when they’ll have it. Even McLaren’s had enough at this point. Now Alonso’s car is starting to incur grid penalties for using extra drivetrain components, guaranteeing that he’ll start from the back of the grid whenever McLaren has to replace something. Given that one of the main components of Honda’s hybrid system can only last about two races as it is, more grid penalties for extra power unit component usage are likely—which puts Alonso even further away from the start. I think you get the point. You’re more likely to scientifically prove that the earth is flat than McLaren is to get a win this year. Alonso just dropped the most polite hint that he’s looking for work ever. Bonus points if you have some ties to a Le Mans or Indy 500 team, of course.